You’ll see the Arboricola used all over Punta Gorda, Cape Coral and Pine Island because they're easy to plant and care for. Plus, they look great almost anywhere. The yellow and green foliage looks great in both formal or informal settings. Sometimes known as the “Triette” it looks best when it's trimmed to 2 or 3 feet. Cold hardiness goes down to zone 9b. We rarely see temperatures below 35 degrees. A few uses include; foundation plantings, lining a garden bed, a low hedge or to act as an accent to other palms and trees. They’re moderate growers that prefer partial sun and shade. 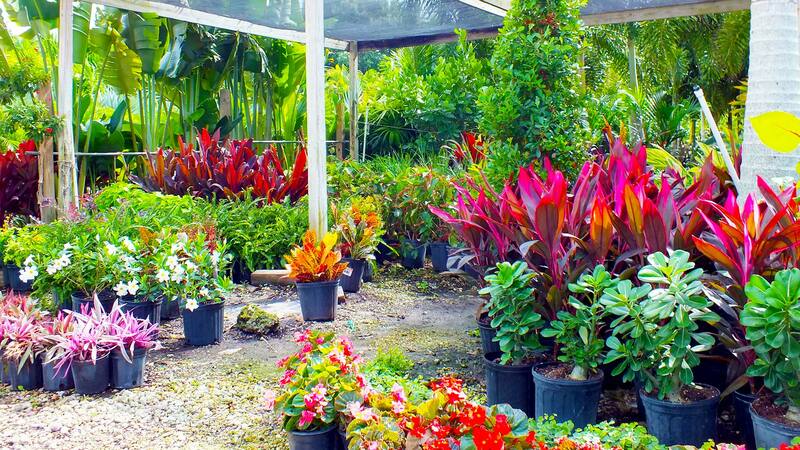 Learn more by calling us today at 239-362-4327 or tour our nursery. 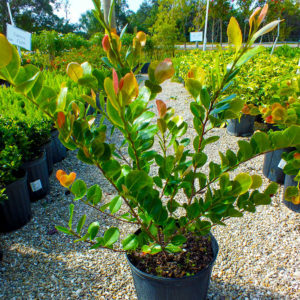 The Red Tipped Cocoplum is one of the best hedging shrubs for your Charlotte and Lee county landscaping project. It can grow to be a large bush if you let it. Most commonly it's kept as a 4 x 4 foot medium sized hedge. You'll find that the dark green color of its’ rounded leaves are leathery to the touch. The red tipped leaves are the new growth. Moderate in growth and salt tolerance, this bush can be used in applications near the beach or inland. Once established, it is known to be drought tolerant. Keep in mind that it’s sensitive to frost and should be planted in a protected area if you’re east of Interstate 75. Crotons are a shrub that can be grown in or outdoors. 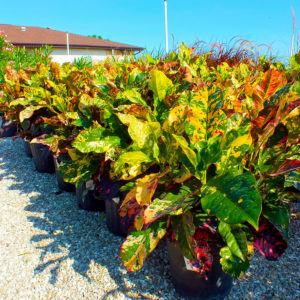 If you live in Punta Gorda or south to Pine Island, you may want to include these plants in your next landscape design. Colored leaves range from bright yellow and green, to orange and red, as well as the darker hues of these colors. They'll add a floral textured element as a low bush near the foundation of a building or a lower level to your landscape’s look and feel. They love full sun (Plenty of that in Florida! ), so water them frequently and plant a group of them 2 to 3 feet apart. 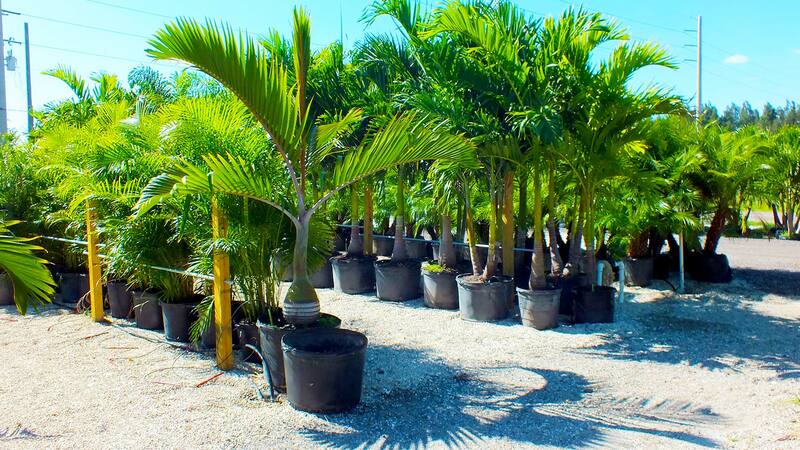 Visit our nursery on Taylor Road in Charlotte county or call us at 239-362-4327 to schedule a free consultation. 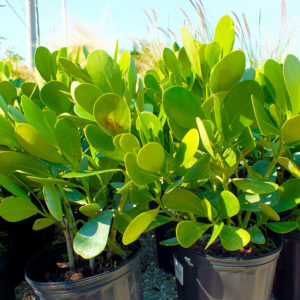 The Dwarf Clusia is an easy to care for drought-tolerant plant, that works well as a ground covering. Landscape designers often add this unique, yet informal semi-succulent into new or existing landscapes. 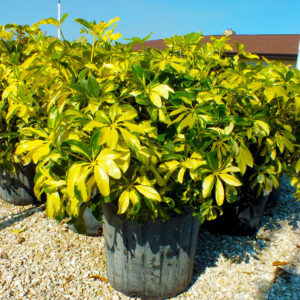 Plant on 2 1/2 foot centers to give low growing shrub the space it needs to spread out evenly. It’s small succulent like leaves are light green and curios to the touch. Full to part sun locations will proved the appropriate amount of light. Maximum height is 2’ and the spread can be up to 3’. Common uses include; as a border plant along a sidewalk, walkway, or in a garden bed. The Blue Agave at first glance appears to be a desert plant, not so much tropical. However, the sandy well draining soils of Punta Gorda, North Fort Myers and Pine Island is an ideal soil type. Also, our year round sun and warm temperatures make for an endless growing season. They're unique and require little maintenance, water or fertilization. 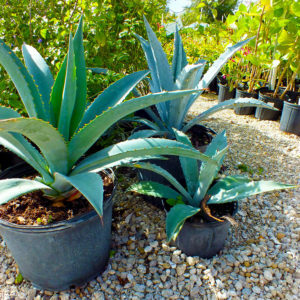 Blue Agave is wind resistant and drought resistant, which is perfect for the long dry winters in Southwest Florida. Some applications include as a single yard specimen or as an architectural accent.